At Windsor we understand the need for a budget option when looking at video walls. So we have some good alternative options, using regular bezel screens. When mounted together can create an equally impressive big screen solution. Think creatively and you can create stunning visual effects even with a limited budget. 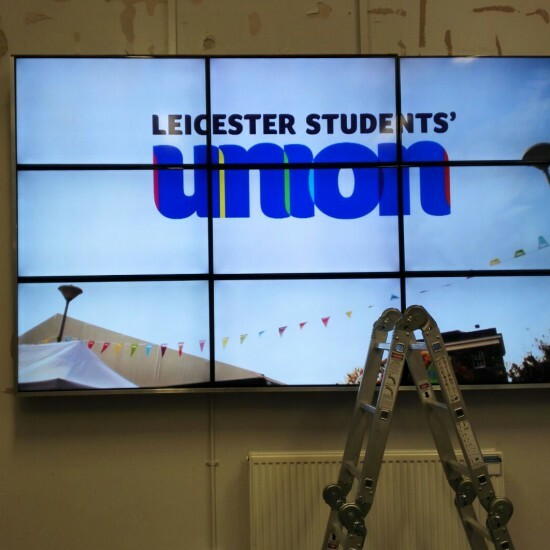 We are able to create video walls using standard screens, not usually used for such applications, creating an entry level opportunity without breaking the bank! Or, for what we call, a bank of screens, again standard screens can be used. 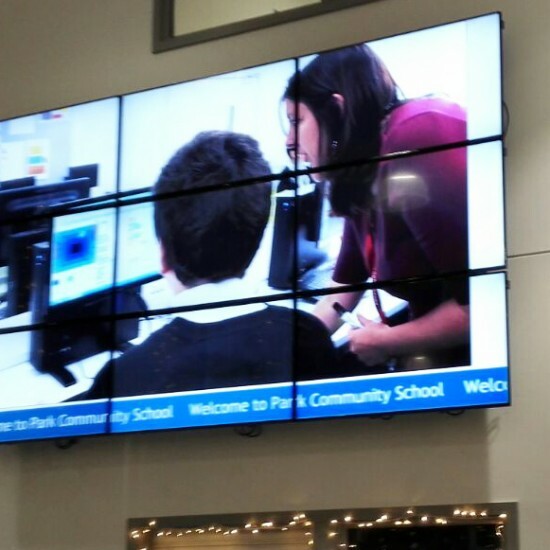 Digital screens can be used to create creative eye catching digital displays. If you have a creative digital idea talk to us today, Tel: 01252 560 911. 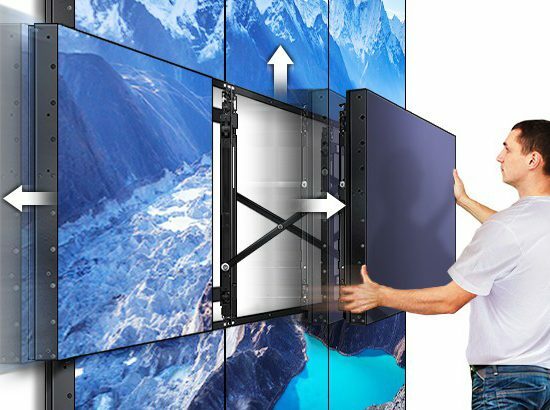 Video wall screens are different to regular screens, they have thinner bezels (frames), and today there are several brands who now offer a bezel free screen. 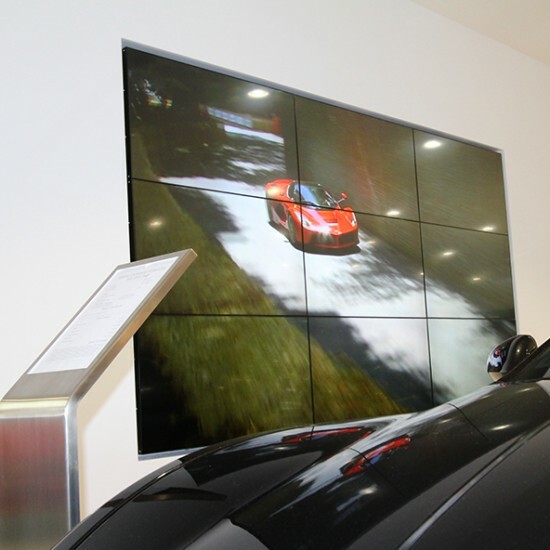 These ultra narrow bezel screens create seamless video wall image, the narrower the bezel the better, yet more costly. To allow the screens to be mounted along side each other, these Video wall screens have a common bezel size, top and left bezel and a common bottom and right size bezel. This gives an even size bezel when mounted together creating your video wall. The overall bezel size can vary from combined size of 5.5mm to 1.2mm, with an average combined bezel size of 3.5mm. 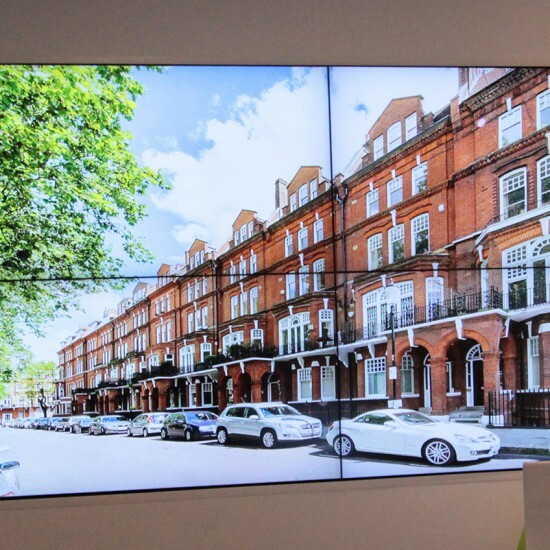 Video wall screens do not often have finished edges or sides, which is why many video walls are set back into a false wall or have a purpose built frame/surround to finish off the sleek look most people are looking for. We use a number of manufacturers and suppliers, which enable us to offer you a video wall solution tailored to your requirements and budget. Contact us today to talk about your project. Above images show the difference in bezel size – A regular bezel screen Vs An ultra thin bezel video wall screen. When creating a video wall, you have to also consider the practical side. 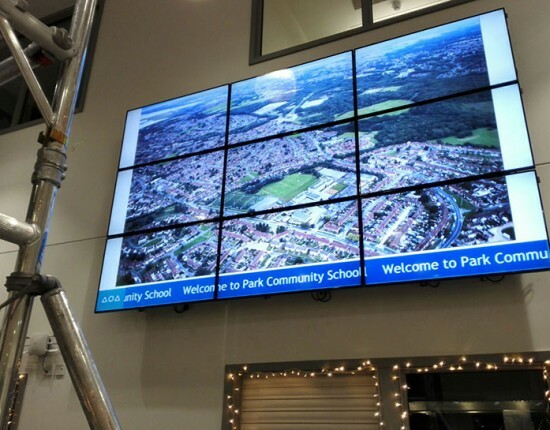 Here at Windsor we like to ensure video wall installations are as practical and user friendly as possible. If we are installing, we use a modular video wall mount, which can be used to create unlimited video wall configurations in both landscape and portrait format. The mounts we spec feature a pop-in, pop-out system which enables quick and easy access to the rear of the mounted screens, for servicing and maintenance. They also have an 8 point micro-adjustment, making accurate screen alignment quick and easy. There are various other Video wall Mounting solutions, some offer easy adjustment, but without the push-in push out option. Other more budget options will simply allow you to mount onto a wall bar & bracket system ( of which do not have the push-in push-out or micro adjustment options). Windsor has the expertise and experience to ensure you get the best solution to meet your needs and budget. Call us today for you FREE QUOTE 01252 560 911.